Ubisoft's Ghost Recon franchise has always occupied the "tactical military shooter" space a bit uneasily. The series initially focused on brutally lethal engagements in long, outdoor spaces but with the Advanced Warfighter games of the mid-2000's evolved to cast the player as a technologically enhanced one-man army, pitting him against tanks, helicopters, and platoons of enemy soldiers. Ghost Recon: Future Soldier represents a continuing (and some would say, inevitable) move away from the series' tactical roots and towards Call of Duty's action setpieces. Don't let that worry you too much—it still retains a good chunk of the tactical gameplay that made the original games so demanding and satisfying. Still, Future Soldier occupies a somewhat uncertain space between pure shooter, stealth and military tactics. It doesn't always balance those three aspects gracefully, but by and large it's a fun, successful hybrid. Like many a military shooter these days, Future Soldier's main menu is broken into three gameplay types: The story-based campaign is a meaty chunk of gaming that lasts anywhere from 8 to 12 hours and can be tackled by up to four players in co-op. Versus multiplayer involves four types of objective-based game-mode, and "Guerrilla" mode is a cooperative multiplayer mode centering around fending off waves of enemies. I'm going to defy reviewing conventions by talking about multiplayer first, because I am crazy like that. Also, because the versus multiplayer in Ghost Recon: Future Soldier is a whole lot of fun. Ubisoft's messaging pushes GRFS (please, yes, can we please call this game "Gurfs"?) as a "thinking person's shooter," and to a great extent that's true—and it's most clearly true in multiplayer. Future Solder's four multiplayer modes—conflict, saboteur, decoy and siege—don't bring much new to the table by way of design. Conflict hustles players between ever-changing objectives, keeping every map fresh while giving more structure to the shooting. Saboteur involves escorting one character with a bomb across the map to plant it. Decoy is a fun riff on assault/defend, with the assaulting team hacking three possible locations to determine which one is the real objective and which is a decoy—teams must smartly deploy, since there are too many possible objectives for a protracted defense/assault. Siege gives every character one life with no respawns, and sets them about similar objectives to the ones found in the other modes. It's good fun—with no respawns, the match where I, left all alone, took down the remaining three enemy teammates to win the match was a unique thrill. WHY: Ghost Recon: Future Soldier can feel a bit ungainly, but for the most part it successfully balances stealth, tactics and all-out action. Type of game: Third-person military shooter with an emphasis on squad combat, stealth and tactical gameplay. What I played: Completed the single-player campaign on normal difficulty in about 10 hours. Played several hours of multiplayer across all game types and a couple campaign missions in co-op. When a plan comes together; clearing out an enemy encampment without anyone realizing we were even there. The way that the controller bumps in your hand when your bullet hits an enemy. Weird and unrealistic, but a welcome bit of tactile feedback. Difficulty spikes—an arctic mission alongside a tank is way too easy, but a couple of other missions are too difficult, with checkpoints spaced maddeningly far apart. The single-player story, though varied and lengthy, is so laughably unfocused that it winds up feeling a tad insulting. "I think I figured out who the bad guy is! No wait, that's the guy we rescued earlier." "1,000 gun customization options, and I pretty much just want the one with the red-dot sight." "For some reason I want to wear a bandana over my face all the time now." Being a third-person cover-based shooter, GRFS moves at a considerably slower pace than its first-person competitors Call of Duty and Battlefield, yet is faster and more deadly than third-person games like Gears of War and Uncharted 3. Intel is key in GRFS multiplayer—at any given moment, the best thing you can do is find a way to learn your opponents' locations. The game offers any number of ways to do that, from remote-controlled aerial drones to sensor-grenades that light up every nearby enemy to the nifty (and brutal) ability to tase an opponent and hack into his suit, thereby lighting up all of his teammates for a set period of time. Getting hacked and giving up your teammates' locations is a uniquely humbling experience—it's teabagging with a deadly purpose. Any time an enemy is "visible," they'll pop up as a red silhouette on your soldier's augmented-reality display. When the enemy team gets hacked, it's a total game-changer. Everyone becomes much more vulnerable, and whatever stealth may have been afforded by smoke grenades, reduced lighting, or cloaking technology are rendered moot. It's nice to have an equalizer like this, and the emphasis on intelligence really does make the game feel more thoughtful and interesting than its twitchier brethren. Of course, once the game has been out for a while, as players get better and better and as the best players' skill and unlockable gear improves (like every other shooter, multiplayer characters rank up and unlock new, better gear) it could become just as unwelcoming and difficult a place as any other shooter. But from my limited time with it, I was impressed with how approachable and balanced Future Soldier's multiplayer suite feels. On to the campaign. Which is a mess both generally enjoyable and occasionally maddening. Fans of both Ghost Recon Advanced Warfighter and its sequel will find many of the same mission types here—stealth segments leading up to a full frontal assault, using an unmanned drone to mark targets while creeping around an enemy encampment. The odd solo stealth mission, holding off waves of attackers while waiting for evac—all of the check-boxes are ticked. The "story" holding the story missions together is such a pasted-together hodgepodge that it almost feels like some sort of sly joke, like a form of postmodern storytelling. "Here," Ubisoft seems to be saying, "have a Techno Thriller. It is equal parts Techno and Thriller. See that waypoint? Head towards it." I can say without exaggerating that Ghost Recon: Future Soldier has the most unfocused, nonsensical plot of any military video game I have ever played. It makes Modern Warfare 2 seem like Die Hard by comparison. One minute you're in South America, the next Africa, then three seconds later you're storming through huge bases in the arctic with a mechanized tank. Then onwards to Russia, to take part in a vague coup so undeveloped and under-explained that I was shaking my head and laughing with each tiny, inconsequential cutscene and every bit of nonsense satellite-map exposition. I suppose it doesn't matter all that much. 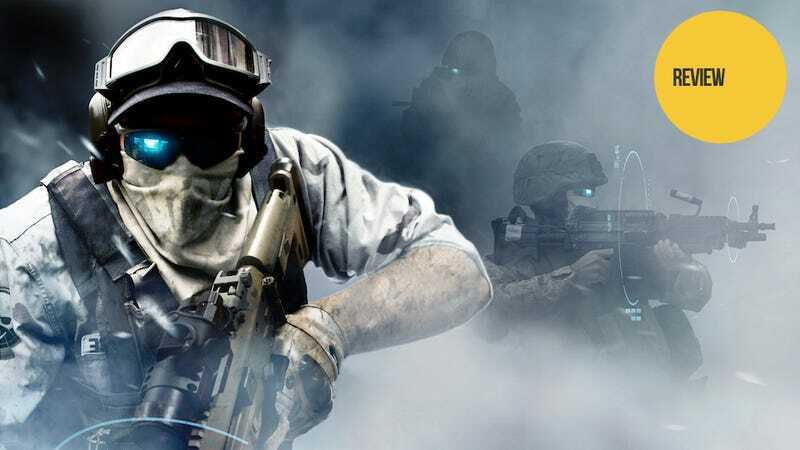 Ghost Recon: Future Soldier may prove that a game like this doesn't "need" a story—its campaign is essentially a collection of unconnected missions, much like multiplayer. The upshot of any given cutscene is that the four Ghosts you control are big huge badasses, and they are way cooler than all the know-nothing jerk-off soldiers on the bases and aircraft carriers where they hang out between missions. That about sums it up. Story notwithstanding, the campaign feels meaty, and is much more substantial than the brief offerings in both Advanced Warfighter games. The gadgets are neat enough, though they're not all that varied—x-ray goggles are a mite overpowered, and make you wonder why the Ghosts would ever opt to use regular green night-vision, and the predator-like "active camo" feels somewhat shoehorned in and unnecessary. That's exacerbated by the fact that the enemies just aren't particularly smart, and are binary in their alert/not-alert status. In other stealth games like Deus Ex, Crysis and even Ubisoft's own Splinter Cell, AI is advanced enough to allow you to toy with your enemies and lead them on wild goose chases. Future Soldier strictly demarcates between the segments when you are to be quiet and the segments when you can be loud. It's a shame, since half of the fun of having an active-camo stealth suit is the thrill of the hunt. That said, the stealth segments were still plenty enjoyable, fun enough to make me wish the entire game was the sort of limited engagement, sneak/attack/re-sneak thing that GRFS does so well. The game's designers do sometimes try to don their Call of Duty hat and throw you into some awkward scripted cinematic/shooting sequences that feel jerky and strange. Those scenes, however, aren't all that frequent and generally pass without too much unpleasantness. The entire campaign is playable by up to four players in co-op, which is a cool feature—if you've got three good friends with Xbox Live, you could certainly do worse than to get this game and work through the levels on the hardest difficulty. I played some co-op with a fellow reviewer, and we came to the conclusion that while the game was fun in co-op, the auto-fail stealth sections would require one hell of a lot of coordination, and would probably get frustrating very quickly. A last note about the story (okay, fine, I guess it bothered me a little!) While I do think that the game doesn't "need" a great story, I want to be on the record as saying that it would have benefited from one. By the end of the campaign, I felt like I barely knew these four guys I'd spent all this time with, and that was a shame—they're built on familiar military archetypes, but I found that I enjoyed trying to figure out who they were as dudes. Is there really a reason that we couldn't have gotten stronger character development and maybe something to hold on to narratively—a consistant villain, some memorable macguffin, something to tie all of these missions together? As it stands, the missions could be played out of order and it wouldn't make the story any less coherent. This willful shrug to storytelling feels damaging and unnecessary to me, particularly when I look at the interesting things that Ubisoft is doing with the upcoming Rainbow 6: Patriots. Ghost Recon doesn't need to overcorrect to that degree, but I felt more invested in and excited by that live-action Ghost Recon promotional short film Ubisoft made than I did in anything that happened in the game itself. I can't help but hope for a little bit more from a modern video game, so I can't help but be disappointed. Despite that, and despite trying to streamline a few too many different things into one game, for the most part Ghost Recon: Future Soldier is a success. It simply feels good to play—the third-person camera is gritty and interesting, and guns are punchier and easier to control than ever. The sluggishness of GRAW has been done away with almost entirely, as has some of the unit micromanagement that, while cool in theory, never worked too well with a controller. GRFS is also quite nice-looking—while some of the game's textures are a bit crusty, the overarching look is strong and distinctive, continuing Ubisoft's tradition of austere, considered art design embellished with some neat visual flourishes and moments of real natural beauty. Time will tell how the multiplayer will hold up, particularly since Call of Duty has so thoroughly dominated the online shooter space since the last Ghost Recon was released in 2007. But for players who can put together a team of friends, I could imagine Ghost Recon: Future Soldier holding no small amount of lasting appeal. The Ghost Recon franchise has always been a bit of an odd duck, trapped somewhere between the cartoonish war-play of Call of Duty and the cold, close-quarters tactics of Rainbow Six. Future Soldier feels like a new stab at equilibrium, and while Ubisoft hasn't nailed it quite yet, Ghost Recon: Future Soldier keeps its balance when it counts.